*Disclaimer* I am not claiming this will work with every animal, this is just what worked for me. And if you have multiple cats or small dogs, etc, it will be extremely hard since they will mimic bad behaviors. Also if you are near me, I will train them myself, for a small fee. -Move the litter box or potty pad right next to the toilet and give plenty of praise and a treat when they go on it. If the litter box or potty pad was far away from the toilet you might want to split this step up and move it a little closer and closer each day to the toilet. Chances are, they will like this new "game" of getting a treat for something they have been trained to do, and will want to continue these behaviors. -Add a phone book under the litter box or potty pad, so it is elevated a litter higher than the ground. -Add another phone book. Keep adding phone books every day until it is level with the toilet. Keep giving lots of praise and treats for good potty behaviors. -Remove the litter box or potty pad. Now there are many kits for this step, but I was cheap and used a giant piece of cardboard from a pizza box. Draw 4 circles so you have 4 layers on the carboard inside your toilet seat ring. Place the huge square (or you can cut it to fit the shape of your bowl) under the round toilet seat. Add litter (preferably flushable) to the hole on top of the cardboard. -Cut the smallest ring (which should make a tiny hole about half the size of your palm) out of the cardboard and put litter around the rest of the cardboard in a circle. Some pets will be unfazed, others will freak out. Let your pet adjust to this for a few days, I waited two. keep giving plenty of praise when they go on the cardboard. -Cut the next ring of cardboard out, and sprinkle new litter around the smaller cardboard ring. Give plenty of praise when the pet performs their skills on the toilet. Remember, if your pet decides to go on the floor or has an accident, you can always go back a step. -Remove the third ring. You should only have one ring left. Your animal will have to balance on the outer part of the cardboard, or the toilet seat to go. And keep in mind, this will be a little stinky for the two weeks it takes to accomplish toilet training. If they can go on the potty well, give them treats, if they are having problems, go back a step or two. Sometimes Fennecs can be brats. I bottle fed her. I took off the first two weeks I had her off work and brought her everywhere with me. She was my child, and she loved me so much. She was so sweet as she got older too but there was one problem. I started to spoil her very badly. When she didn't get her way, she would pout like a 2 year old. One time, I didn't give her any of the people food I was cooking in the kitchen (as I usually did, but this meal was unhealthy even for humans), so she decided to put herself in a corner and started being krusty. I walked over to her, saying, "It's not that bad, I will give you Cheerios later." But she gave a little squeak as if to say I don't WANT Cheerios! I want your crappy people food! I tried to pet her and show her a new toy instead, but she squeaked and turned her back to me in the corner. I said, "Fine! Stay in the corner and pout" as she looked at me and gave me an evil look. So later that night, once she had cooled down, and started running circles around the coffee table again, I decided to see if she was still being krusty. Sure enough, I went to pick her up, and though she knew she could do nothing about it, she refused to look me in the eye or make her purring noise while I pet her. As soon as I put her down, she decided to run back into her corner. Well, I decided since she was already pouting, a bath couldn't hurt, right? After her giving me truly evil stares while bathing her fluffy little self in the sink, as soon as I dried her off, she bolted into her cage. She decided she was going to be krusty for two more hours. I tried numerous times, even offering Cheerios as a peace offering, but everytime she saw me, she would go to a corner of her cage, refusing to give me the courtesy to even look at me. After 2 hours, she decided to finally come snooze with me for a couple minutes before running again as if to say, I am sorry I was such a brat. I just wanted Cheerios and thought pouting would work! I scratched behind her enormous ears, and all was well. Sometimes Fennecs love to snuggle, but it's always on their terms. So today my cat reminded me of a very funny thing he does. 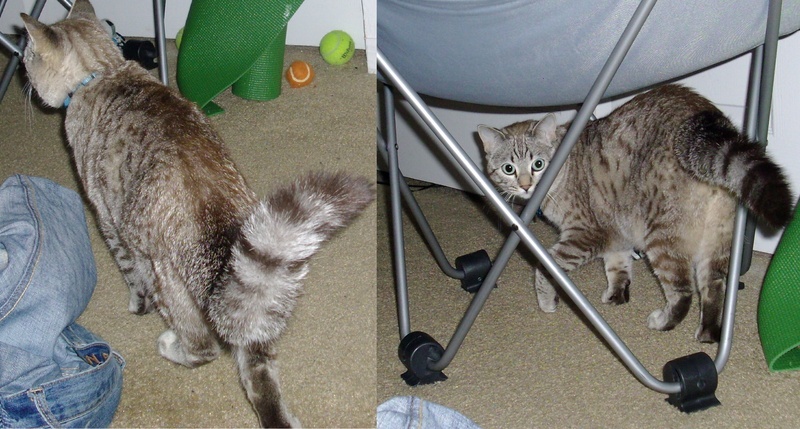 Whenever I play hide and go seek with my cat (well, it's more a game of seek, the cat hides in a room and I search for him, but when I find him he runs to another hiding spot), his tail gets SUPER puffy, like the picture below. When he used to play with the fox her little foxy tail, which was already so puffy, would fluff up even more. My vet told me cat's tails, he wasn't sure about the fox, puff up when they are scared. But my cat is totally calm, just a little mischievous when we play hide n' seek. So I really wonder, were the cat and the fox really just scared or mischievous? None of my animals ever really liked baths, due to whatever circumstances. Some foxes like baths, some don't, depending on their personality type. Some LOVE it, and some HATE it. Most foxes never like baths and because I made the mistake to not give her baths until she was older....This was the case. She saw the baths and was like, ZOMG! That clear wet stuff comes in bigger shapes than my water?! When I placed her gently in there, coddling her the whole time, she looked up like, Excuse me? You might say it's fine but, clearly, I don't like it! She would flail and whimper and get her point across that she was not happy with me, especially the look on her face. I could tell most of the time what she was thinking by her eyes. During bathtime her eyes would say, If only I wasn't a three pound midget, we'd see who holds who in the water. But eventually she got a little used to it and tolerated it with a pitiful look in her eyes. Eevee has the best personality of any Fennec fox I had ever met, she loved to held and petted and given attention to, and she never nipped, but she refused to be potty trained. I tried everything in my power to potty train her but she just felt like going wherever she wanted to go. And my cat Alias, who has delt with the fox with patience, used to LOVE water, he would play in the sink, the bath, and ice cubes. He would play with his mini tennis balls and swim back and forth through the water. Until the one day. I was taking a bath myself (which is really rare since I never have the time to relax) and I actually had bought some bubble bath instead of being cheap and using shampoo, and I lowered myself into the mound of bubbles. Well, Alias jumped up onto the side of the tub, wondering where I had gone, when he fell in! He had gotten soap and bubbles all in his mouth and eyes, and ever since then, he associated the bad memory with the taste of bubble bath. He must have been thinking, You tricked me! That good smelling stuff tastes bad and stings! Our newest bath day was lovely, however, this time the cat just sat there as I held him down and rinsed. The only problem was he was letting out a deep, raspy meow that sounded like I was beating him. My next door neighbors were out walking and came over at one point to ask if everything was okay. I simply said, "Oh, it's the bath time." And so we went for walks, which at first they were more like drag-alongs, but now he walks perfectly fine on a leash. In fact, when he feels like going out for a stroll he will calmly wait by the front door. Sometimes he meows incessantly if you ignore him. But one day, he thought one of his little nine lives was up. We were walking calmly on the sidewalk as usual, when this little Rat Terrier shows up. Have you ever met one of those animals that are so vicious, hates other animals, bites and scratches it's own owner, yet the owner still thinks they are God's gift to the world? Well, that's exactly how this ugly Rat Terrier's mommy felt. The excuse for a dog started growling and going crazy at the site of my cat, but the woman had one of those retractable leashes (which should have been pulled snug like my cat's was) and the dog ran towards us in a flash. He bit my cat really hard right on the thigh, because my cat didn't run away, at first thinking he wanted to play. The dog wouldn't let go so I shoved him sharply away from my cat the woman screamed "Stop it! Stop it!" When I realized she was NOT talking to the dog, I grabbed that little 5 pound mutt and had to hold him away from my cat, who clawed his way up to my shoulder. Now I was pissed. I am not a very angry person in general, but people such as this woman could start my temper going in less than five seconds. And now I have scratch marks to prove it because I hadn't trimmed his nails yet this week. After calmly grinding my teeth and telling her she should have kept her dog on a tighter leash, while she was screaming at ME to control MY cat, I ended up walking away as she yelled, "I could sue you!" At this point I calmly said, "Go ahead." So now, naturally, my cat is terrified of dogs, and this stupid woman undid my 2 months of socializing my cat. Today, I was walking my cat as normal, and everything went fine except for the usual car starting, and then two tiny puppies ran out from the neighbors front porch. The puppies were adorable and harmless and didn't even notice the cat, but my cat almost did an air 360 as he tried to pull in the opposite direction. I just picked him up, feeling his pounding heart, and surprised he didn't have a heart attack, brought him back to our doorstep. I had even been taking him to visit my neighbor's dog almost every other day! He is just sitting happily on my pillow, glad he survived his second 'near death' experience. Has Anyone Seen a Fox? 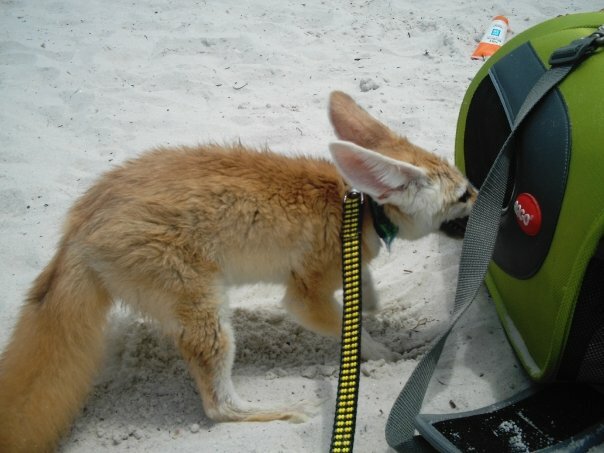 I would take my little Fennec to the beach very often. I figured hey, Fennecs live in the desert so she should love the sand! Well, the first visit was kind of rough. There was almost (I would venture out to say 'sandstorm' but it wasn't quite as bad as the ones on National Geographic) a storm. It was extremely windy and sand would hit you so hard it stung your skin. So I only stayed there for about half an hour and she stayed hidden inside her little impact-resistant carier. The next visit went a lot better. There was no wind, barely any people, so I didn't get swamped with the usual questions - Is that a fox? Are those legal? Will it attack me? Can I get a picture with it? Where did you get it? etc. So I let the little one out on her leash, and she looked around like 'whoa, where the heck am I?' and she immediately starts digging. Finally! A place she will be free to dig at without getting in trouble! So I laid down with her leash around my wrist, feeling a little tug here and there as I enjoyed the sun. Well, I took an unplanned nap, resulting in two unfortunate events. One, I got burned on my entire front side. Two, I still had the leash on my wrist, but no tugging, and she was gone! I was freaking out, looking left and right, but no she was not anywhere. :ohmy: I asked my friend, "Have you seen her?!" I called and called for her, whistling like I did when she would get a treat, standing up with the retractable leash still on my wrist. ...so of course I decided to get a second fox in April 1997. A fennec is a three-pound desert dweller native to the Middle East, sharp-toothed and short-tempered, with enormous ears and dark, soulful eyes. Fennecs don't walk anywhere; they dash, lightning-fast, tail high. Like any fox, they can be imprinted and trained, but not tamed. So I know where she is and what she's doing, Julian wears a bell, handmade for her by a falconer friend I've known for years, who's the gentlest, quietest, most inoffensive guy imaginable. Julian took an instant and inexplicable dislike to him, and when I shut her in her box she screeched dire warnings for the duration of his visit. The only man she fully accepts is my father, who feeds her greasy fast food on the sly. She bosses Asha unmercifully, snarling and snapping if he comes too close when she's eating or playing with a toy, or sometimes for no discernible reason at all. She climbs him like a mountain to stand on his head, and uses him to jump on and off my recliner. She, too, steals his chewies, and he endures it with that legendary Golden Retriever patience. At other times she'll snuggle up against him, her coat and his so alike it's hard to tell who's who. She'll bring him a dog biscuit from the jar on the counter, lay it in front of his nose and watch him eat it, then sprint off for another. The record so far is twelve in a row. When he hears her fishing in the ceramic jar Asha thumps his tail, blithely forgetting how she sinks needle teeth in his ears and digs tufts out of his silken coat. Her dinner each night is a well-balanced buffet, set out of canine reach on the kitchen table: a mouse or rabbit or squirrel meat, diced mixed vegetables, honey toast, miniature carrots, assorted sugar-coated cereals, fruit of the day, the occasional leftover from my dinner, and a dish of vanilla liquid diet supplement. She checks it all carefully, then, like any four-year-old, she runs off to eat the dead leaves stuck to the firewood. The trick to living peacefully with a fox is a policy of complete capitulation. To keep her from pulling down my curtains in her effort to walk on the narrow windowsills, I installed wide carpeted shelves. When she developed the habit of creeping about in the cupboard, knocking over dishes, I crammed all my dishes onto the top two shelves and lined the bottom shelf with soft flannel. Insatiably curious, she comes running when I call, because there's always something fun or yummy or interesting. She somehow makes me feel honored when she accepts treats and toys. When she wants to be petted-and she's remarkably affectionate-she regally presents herself, confident from experience that I'll drop whatever I'm doing. If I take too long to finish reading a paragraph, she slides in front of the book. At night she fox-naps on me, leaping off without warning, then jumping back up just as suddenly. The cooler the house, the longer she lingers; never ask a chilly fennec if she loves you for yourself alone. She's a tiny little tyrant in a woolly, sand-colored coat, and I can't imagine life without her. Positives of fennecs as pets? DB: I personally think they make one of the neatest exotics pets out there. They are simple to take of, and very small. I never met anyone who didn't think they weren't adorable and cute with those great big ears. Their food expense is relatively low, and even the smallest apartments have plenty of space for them. 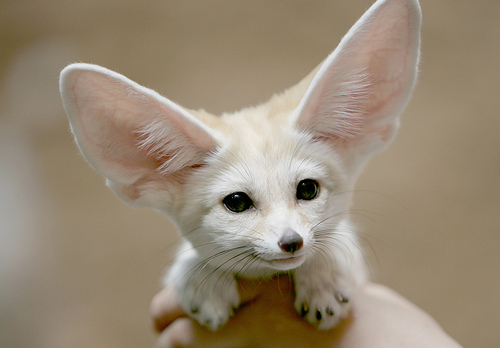 Fennecs are endearing, addictive, have cute little voices and very social little creatures. DF: Julian is gorgeous, intelligent and graciously allows herself to be adored. JR: One of the easiest to care for and most social of all exotics. GC: Generally they are sweet and affectionate. They are very engaging, and pretty small, so they are easy to care for. They are also easy to feed and house. Negatives of fennecs as pets? DB: Their size is also their worst negative. They are so small and quick they can get under your feet-causing you to step on them, or jump from something high. Both of these have caused fatal injuries in fennecs. You have to be careful with young children so they don't drop them, accidentally causing them harm. Some foxes use your house as their bathroom, rather than a litter box. They startle easily and you have to be careful how you take them outdoors. They have been known to get out of harnesses, and take off. DF: Unreliable litter box use; prefers sink, countertops, bookshelf, chair I'm on... etc. Does not get along with any animal I have except my Golden Retriever. Will bite me if I do something she doesn't like, such as pick her up or interrupt a nap. JR: Challenge to litter train. VERY fast. 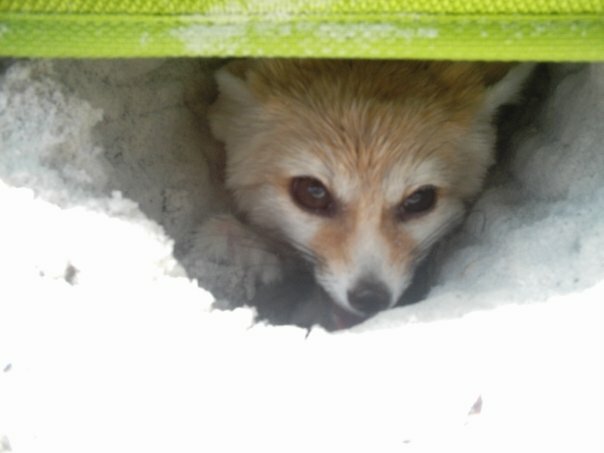 A grown fennec can fit thru a chain link fence hole so one must plan enclosures, house or otherwise, accordingly. A fennec does not normally come when called. They can become disoriented fast when somewhere unknown and if you don't have them on a firm lead, they can run away and you'll never catch them. On the other hand I've had several escapes from my breeders and for the most part, they have never strayed too far from home. I've recovered all escapees but two. A thunderstorm helped with one who I never found. GC: Not well litter trained. Actually he's 100% in his cage, but only about 10% out of it. Also, they DIG DIG DIG! Forget houseplants, woodwork and carpeting. Some are also very skittish around strangers. Anecdotes/stories about your pet fennec? DB: Candy was under my coffee table, and Spice (my coati) walked by. Candy bit her tail. So Spice tried to get under the coffee table to get her back, but couldn't fit. Every time Spice stuck her head under, Candy would bite her on the nose. DF: She has a strange relationship with the Golden Retriever; she bites him, but also brings him biscuits. Caches food items in the sheets while I sleep. GC: I got Loki at 9 weeks old. He was very friendly for a while, then suddenly became shy and skittish. Once he was neutered (at 7 months) he became much more sweet and playful again. However, he still hates my husband. Do they have scent glands or an offensive smell? DB: Fennecs are very clean and I find they have no offensive body odor. DF: When very scared or very angry, Julian emits a sharp musky odor from the scent gland at the base of her tail. JR: I've heard of one instance where a male marked with a scent gland. Otherwise no offensive odor at all. GC: I've never noticed one, except when he pees outside of the litter box. It's strong sometimes, other times it's not. DB: Fennec Foxes are the smallest of the wild canids, they live 11-14 years. °They are 10-16 inches long and weigh 2-3 lbs. The female being the smaller one. Their ears are 5-6 inches in height. DB: Yes, they love their humans and other non human companions. They will give you a kiss, roll over for a belly rub, lay on the floor with their tail wagging, or bark for your attention. They get tickled and exited when you come home, and love to play fetch. DF: Demands affection by sliding across what I'm doing, or throwing herself on her back or side in front of me wherever I am, even as I'm walking. GC: Do they ever! Loki will play with anyone or anything (except husband!) He especially loves my sons (ages 12 & 10). He will be alternately a ball of energy and race around playing tag, and then lay on your lap to have his ears rubbed. What is their general personality, disposition, and attitude? DB: Fennecs are friendly, lovable, feisty, and very social. They have great dispositions and are a blast to watch. When they kill their food (Don't care if it was never alive to begin with. ), they pounce on it, run around and scream before they eat it. They are not quick to anger, and they carry themselves proudly as if to say "Look at me, I'm as cute as they come and just as perfect as perfect can be." DF: Curious, playful, affectionate, lightning-fast, great sense of humor. JR: Playful, excited, hi-energy, friendly, a general riot. GC: Sweet and affectionate, but also stubborn and selfish. They want what they want. What you want is beside the point. Also, he sleeps much of the time, like a cat - sleeping most of the day and night with occasional outbursts of manic activity. Are they sweet and petable, or mischievous and playful? DB: Fennecs are as sweet as any puppy out there. They come over, let you hold and pet them, and off they go. They repeat this every hour or so. They love to steal things from you, such as keys, paperwork, knickknacks, and other things. They run up and nip your toes or nose, tip your soda can/cup, take ornaments off your tree, and steal your food. Fennecs love to play with all kinds of toys (Watch out for toys that might strangle them. ), chase you/other pets/their tails, and run faster anything I have ever seen, thru your house. JR: Mostly mischievous and playful but will come up for a 10 second to several minute pet or snuggle. Rule of thumb with any exotic...What you put in is what you get out. In other words, how you treat them will have a lot to do with how they are. GC: Both. Mostly sweet, and very playful. Less tolerance for quiet petting than rough housing. He prefers to wrestle and run most times - at least when he's awake. How destructive are they for an average household? DB: I don't consider them very destructive. They do dig, and can cause damage to your carpets, doors and window sills. If you have an outdoor pen, it'll need a bottom or they can dig out. They can dig up to 20 feet in one night. DF: Not very, unless you count pee stains. JR: Somewhat like a puppy can be. If they are bored they will get into trouble. GC: Not terribly destructive - no chewing habits. Still, they dig a lot, and this can kill plants, scratch doors, pull up carpeting or wear down couch cushions. Do they climb or tear up furniture? DB: They don't tear up your furniture, but will bury their food in the cushions. Fennecs are quite capable of jumping up high or climbing. Actually I can't figure out how something so small can jump so high. Fennecs will climb wire cages to get at prey species. DF: Climb, YES! Tear up, no not at all. GC: No climbing but a lot of jumping and knocking things over. Also, as stated before, the digging can destroy things. Are there any problems associated with their claws? DB: Their nails need to be trimmed like a dogs. They are very sharp and can scratch you good, especially when they are spooked. DF: Need to be clipped occasionally. GC: Occasional trimming prevents scratches. How messy are their droppings? DB: They are firm and solid like a dogs. JR: Depends on what you feed them. Generally stool is stiff and reasonably well formed. Veggies in Veggies out. GC: About like a small dog. The bad part is the urine - it can smell bad sometimes. Can they be litter box trained? DB: Yes, but not all of them are. My little girl is 100% (I got her at 4wks), but my male is 0% (I got him at 3 mths-4 months), unless you count the whole house for him. GC: I've heard that many (not all) owners of females have better luck with litter boxes than with males. Loki keeps his cage fairly clean, but outside of the cage, anything goes. DB: Yes, they come when their called, if your not trying to put them in their cage. They do dog tricks, understand no, and can walk on a leash (Be careful with this so they don't get away. ), will listen most of the time. DF: She will do things for immediate personal gratification, such as go in her cage for a cricket. GC: Somewhat. They like routines, so that can work for you. They are also very food oriented, so will do many things for treats. They also don't have a large attention span, so it's not like a dog. How are they with other pets, larger and smaller? DB: Fennecs are good with certain pets, like cats, some dogs, some ferrets, some genets, and some coatis. You have to supervise their play so the fennec doesn't get hurt. They can't handle rough play or they will be hurt. Now they do play rough their self sometimes, but they can't really hurt these animals. I just correct my fennecs when they get sassy so the others don't get mad at them. I don't allow my fennecs to play with rodents or birds, this is their prey in the wild. They will go after the even if they are bottle feed babies, it's only natural. DF: Gets along with my 12-yr-old Golden Retriever because he tolerates anything. JR: A kitten can make a wonderful best friend. Generally yes. But take into consideration what they might eat in the wild and plan accordingly. GC: Loki loves the cat and chases (or is chased by) her. He also loves to watch our small rodents, though I'd never let him interact with them - they are his natural prey animals. Birds also would not be good as companions for a fennec. From all I have heard, fennecs like almost all animals their size or larger, even if that animal doesn't like them. DB: You can use a kennel, triple deck cage, a room, or a carrier (for when your gone) if they have free reign. They need numerous toys, a den, they like hammocks (watch height), and have a fondness for blankets. DF: I keep her confined in a giant-size dog crate with a shelf I added when I'm not here. Evenings, nights, weekends--her "cage" is my house. JR: I feel like the large three story ferret cage works well. It all really depends on how much time they will be in it. GC: Loki stays in a cat/ferret cage at night and when we are gone. It has shelves, ramps, and places for him to hide in and sleep (he especially loves the hammock). Otherwise, he has free roam of the house. He tends to stick to certain areas - living room, dining room, kids' bedrooms, and occasionally the kitchen to mess with the cat's food and look for dropped food. DB: They should be fed Dry Wild Canid feed, with fruits, vegetables, crickets, meal worms, and eggs. They can also be fed live rodents, but this will cause their urine and stool to become strong smelling. DF: Raw rabbit/squirrel/mice, pulverized with the bones and cut into fennec-bite-sized pieces, fruits & veggies, dry cereal, Ensure, people food, etc. ; she also has dry dog food available, which she buries in my sofa but doesn't seem to actually eat, and occasionally I'll offer some canned cat food which she usually snubs. NO CHOCOLATE. JR: I feed my breeding fennecs a premium brand puppy food and mixed veggies. A pet will eat what you give it and anything it can steal. GC: Combination of dry puppy kibble, chunky canned cat food, and frozen (thawed) veggies. Occasional fresh fruit and cereal for treats. He loves sweets like candy, pop, marshmallows, etc and will steal them if at all possible. Of course, these are not terribly good for a fennec, so this should be pretty rare for those kind of treats. (We don't give him candy or pop, but he's pretty resourceful). What vaccinations/vet care do they require? DB: This should be discussed with an experience exotic vet. Normally recommended is dog distemper, parvo, and rabies. All need to be killed vaccines or they can kill your fox. Mine was dewormed with strongid-p. They should have yearly checkups, shots and stool samples. They can be spayed or neutered. DF: I have my vet give her dog shots: Recombitec 4-way and Imrab Rabies. JR: A lot of vets recommend distemper. This is something you should discuss in detail with your vet and arrive at your own conclusions. My rule of thumb is if they will not be exposed to it, don't vaccinate for it. GC: Basically like that of a small dog. Loki gets Parvocene, Galaxy D (distemper), and Imrab3 (rabies). He also takes Heartguard to prevent heart worm. They need a series of 3 each of the parvo and distemper as babies, then once a year as a booster. Rabies is yearly and the heart worm preventative I give him every month, though it's probably only necessary in months that mosquitoes are out. At what age would it be best to get one? DB: A bottle fed weaned baby would be best for the first time exotic owner. Babies sold on the bottles to inexperienced bottle feeders can die. This due to their strong their strong sucking and the formula ending up in their lungs. DF: I got mine at 11 months and she is wonderful--now. The first few weeks I needed leather gloves to handle her. JR: With most exotic the earlier the better but I have had fennecs successfully bond as late as 5 months. GC: 5 to 8 weeks would be ideal, though before 8 weeks it involves some bottle feeding. Still, it helps them bond with you if they are younger. Other Consideration for owners of fennecs? DB: Remember Fennec Foxes are exotic pets, and will have some wild instincts. Also please don't keep these cute little creatures locked up all the time. It's not fair to them and you would be missing out on so much. Warning, if your fennec bites someone, rabies shot or not, in most states they will take your pet and kill it. DF: Her motto is, if something she does bothers me, that's my problem, not hers. GC: They are not dogs or cats - though they have qualities of each. They are still wild animals and will act on instinct. Punishment doesn't work very well as a deterrent. You simply have to be patient and accept them if they are not exactly what you thought they'd be. What kind of person should own these animals? DB: I think most people who love animals would do fine with a fennec fox. JR: Again, this is one of the best pets in the exotic industry. My only comment here is "if you cannot abide poop in inappropriate places, this isn't your pet. GC: Patient, not loud, vigilant, energetic, lightning quick reflexes would help (I don't have those).